This Monday was first day of this school year; my daughter started her journey in the first grade. She is not a morning person; still she woke up and got ready. I drop and pick her at school; we both parents are not sure about the change she is going through, so for now she is not going on a school bus. May be later we will try that. Since it was busy day I made only chapathi/flat bread and this tofu matar/tofu cooked with green peas. While making her ready to school I was thinking about mine and my sister’s first day of school. Still remember my mom came with us and dropped us at the school. She waited outside till noon on the first day of school as we have classes only class until noon to see if we are crying. My sister was a cry baby, she would cry when mom would drop her in school, and cry for about 15 minutes and then stop. I was more like amused by the new environment so there was no crying. However my daughter was happy she even told me bye when I dropped her at class. After dropping her from the school, I called my dad and told him how I prepared her for first day school. Then He told me now you know how difficult it is to take care of kids. I told him, it is mom who did all the heavy lifting while you were at work. My mom and I were best friends, when I and sister grew up, and ready to go to school and then college, she will stand in the front door and watching us going until we turned around the corner of the house. I remember every day, when doing something, some time it is about making curries which I like, some time it about some movies or song which she like. One day I was crying remembering her, my little guy came and ask me why you are crying. Then hubby told him mama is thinking about grandma so she is crying. He then asks me did you lose grandma. I told him yes I did. I get emotional even thinking about her. 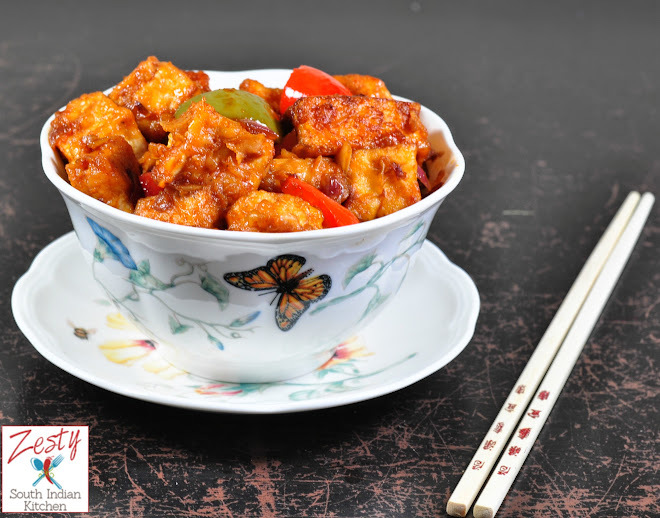 Coming to this recipe, tofu matar, during shopping I buy thinking that I will make this and that. However some time don’t get enough time, end up discarding the things in the garbage. Nowadays hubby sing same song every time he opens the fridge, there is tofu, there is spinach, there is heavy cream, if you are not using this by this date it will go bad. I had bought tofu so decided to make use for this curry so that I can hear warning about stuff that will go bad from his list. 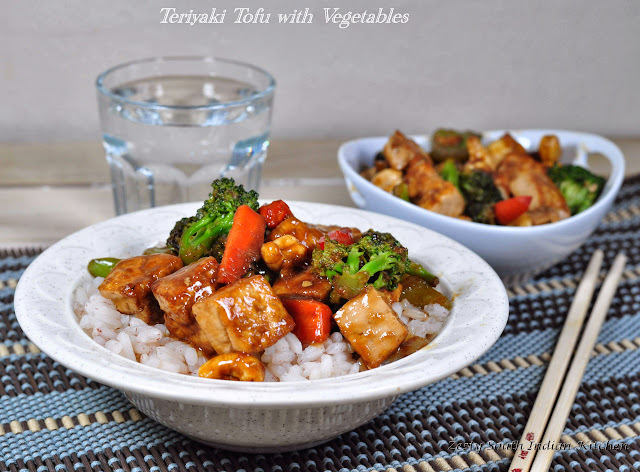 Earlier I made tofu stir fry with spicy sauce and Teriyaki Tofu with vegetables. 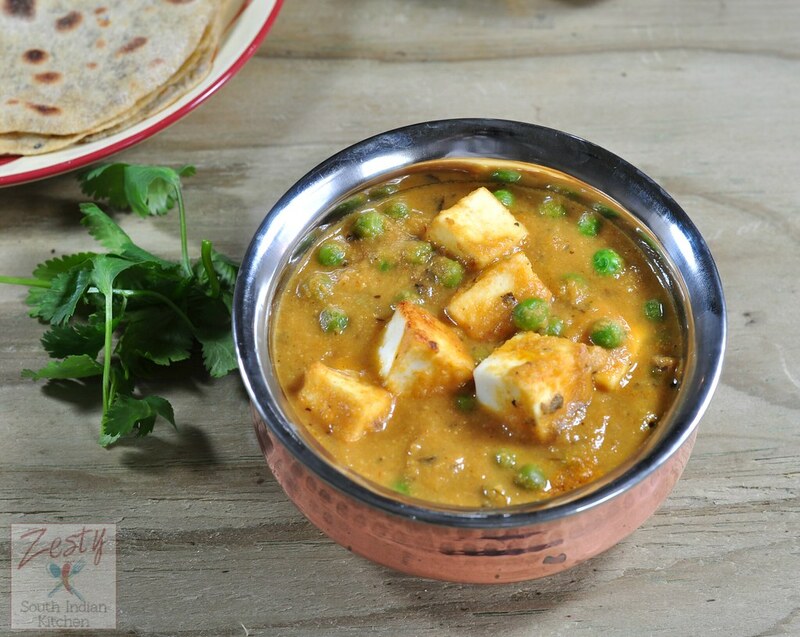 As you know tofu tastes bland, so you need some sauce or gravy to make it delicious, I thought I will use the gravy of my matar paneer (Indian cottage cheese with green peas) to this dish. 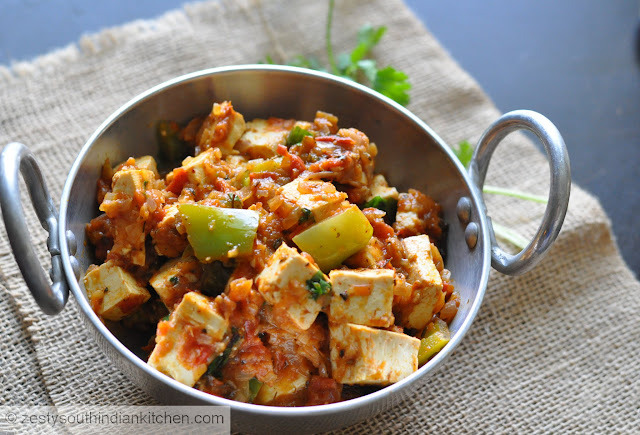 I also tried tofu in Kadai tofu/Tofu and green bell pepper cooked in spicy tomato gravy. I used the same recipe however changed steps here and there also skipped adding heavy cream, and instead of adding whole garam masala as such, used the powder to make it. My hubby’s verdict was best matar curry that you can’t get in any Indian restaurant in the world. I too felt that this gravy gave tofu an exceptional taste. So give it try you will love it, it goes well with bread of any kind. 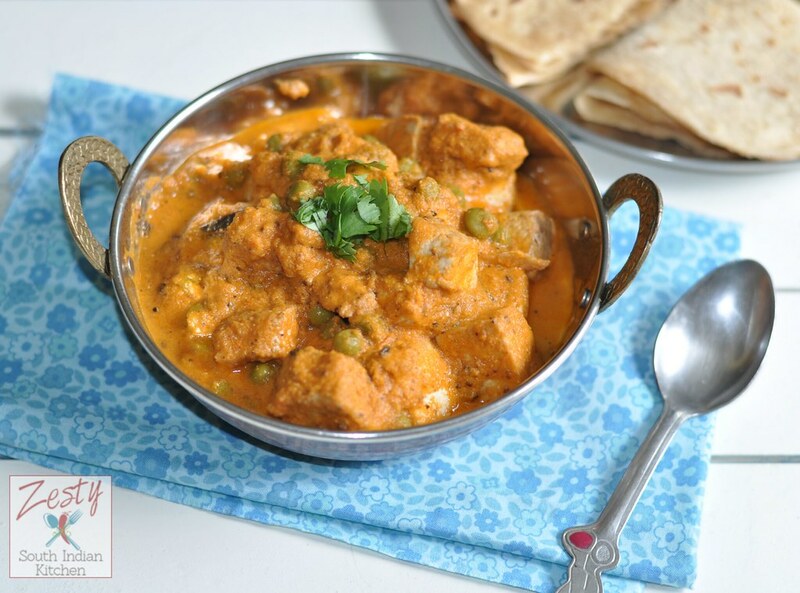 Delicious tofu matar, creamy delicious curry goes well with any bread. Squeeze out water from the tofu and wrap with kitchen towel for 5 minutes so that it will remove extra water. Cut them into cubes. fry until onion become translucent or slightly brown color. until tomato become soft and mixed well onion. Switch off the flame and let cool the mixture for about 6 minutes. and add almond, if you want you can fry the almonds. Grind the cooled tomato, onion almond mixture to fine paste. While the onion-tomato almond mixture is cooling dry roast the whole garam masla including fennel seeds except bay leaves for 1minutes. Then powder them into coffee grinder use only 1/2 tablespoon for this recipe, rest you can save. add rest of turmeric, chili, cumin, coriander powder boil for 15 minutes or until oil oozes on the top . Add green peas and cooks for another 5 minutes (if using fresh give more time, or pressure cook for one hiss and add to the paste). Add ½ tablespoon whole garam masala powder and kasturi methi (crush with hand and add) to this mixture and let it boil for another 5 minutes. Then add tofu and let it boil for another 5 minutes in low flame. Switch off the flame and garnish with chopped coriander leaves and enjoy with chapathi or nan. 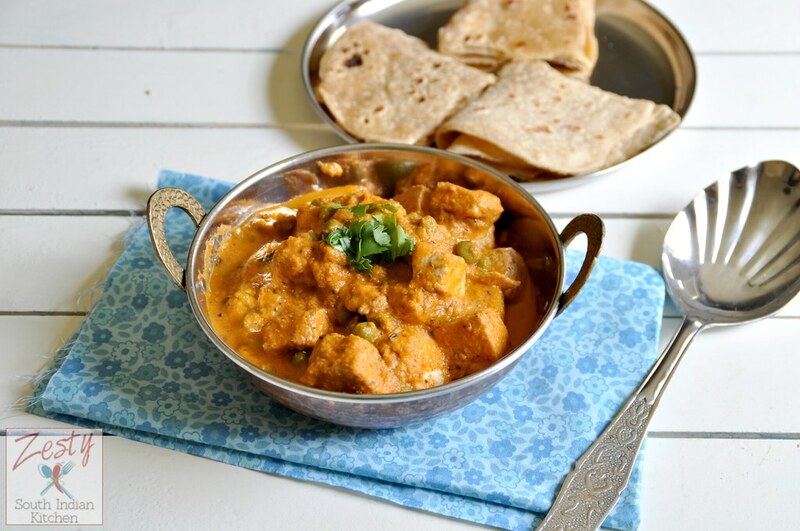 julie recently posted…Boli | Obbattu | Puran Poli | Holige | Festive Recipes & Onam Wishes !! Dearest Swathi, reading your post writeup touched my heart and I too am overwhelmed with emotions. How beautifully you have captured the moments of first day of school now and many years back. Sweetie parents are so precious. I too remember my father and cry silently many times. Truly a hug for you for the heart melting writeup. Coming to the dish, it is totally awesome, protein rich, very healthy and uber delicious and most importantly made with oodles of love. I am sure your princess must have loved it. Thanks Piyali yes when we lose our dear ones it is really hardest thing, I remember mom everyday. Yes she loved this curry it was hit, even I got surprised. Simply droolwothy and delicious looking tofu mutter. Excellent preparation. Great idea to use tofu! 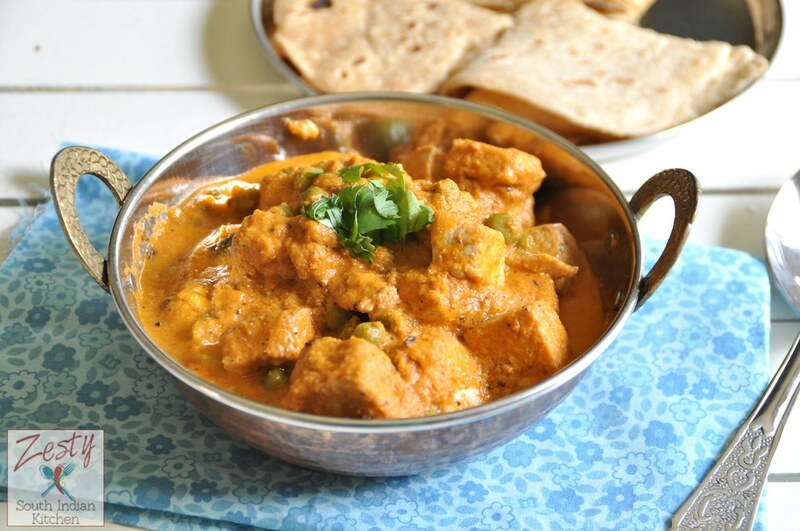 Usually I see paneer and peas in a similar dish but as I use tofu more often in my home-cooking, your dish is right up my alley. Thanks for sharing. Wow! Absolutely delicious and flavors packed. Tofu gives this curry a healthy boost. Delicious. Everything looks so amazing! I would love to try it 🙂 saving this to my Pinterest! Swathi, reafing your post made me travel back to my childhood days flocked with nostalgic memories… Um.. I can sense the the delicious tofu malar here, pack me a box to go! Gloria recently posted…Rasgulla Recipe/Soft and Spongy Rasgulla Recipe. 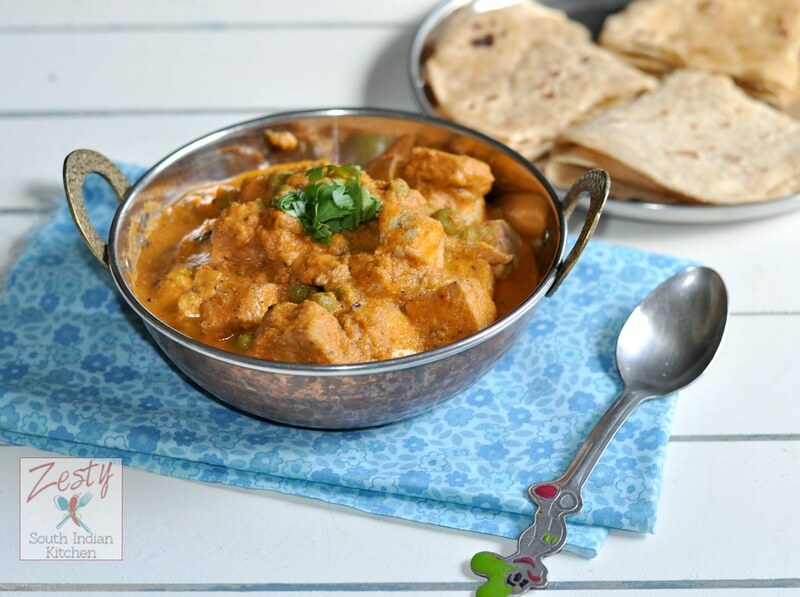 Absolutely delicious protein rich tofu gravy with some nostalgic memories…can’t ask for more!! Swathi, reading your post brought tears to my eyes, I can totally understand how hard it is to lose loved ones! The pain of losing a parent is hard, we just learn to live with it! Your mom invested in you! You are investing in your kids! All are winners! The tofu mattar is bursting with flavor! Pinning!